The El Socorro Centre for Wildlife Conservation (ECWC) is a non-funded, registered non-profit organisation, which has been dedicated to the conservation of wildlife in Trinidad & Tobago through education, rehabilitation and propagation since January, 2005. The ECWC became registered non-profit in October 2011 and a member of the International Wildlife Rehabilitation Council (IWRC) in 2009. To date, we are the only IWRC registered organisation in the Caribbean, but we hope that others will follow our lead. The centre is open to the public (including educational school workshops and camp field trips) by appointment only. Each year, the ECWC hosts about 2,000 visitors at its home base and maintains a strict no-fee policy. The financial needs of the ECWC are met by Founder Ricardo Meade (with the help of donations), who started a small aquascaping company in 2003, which still operates today on a modest scale and helps to fund the project. Ricardo and a small group of dedicated volunteers are responsible for the day-to-day running of the ECWC, including care of the animals and maintenance of habitats. 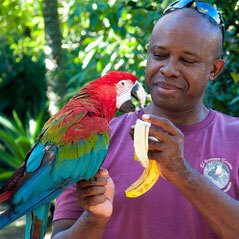 Ricardo holds a certificate in Basic Wildlife Rehabilitation and Pain and Wound Management. He has been attending IWRC and Florida Wildlife Rehabilitators Association's Annual Symposium since 2010. In 2015 he led a delegation of 6 volunteers from the ECWC to the Florida Wildlife Rehabilitators Association (FWRA) Symposium and also visited several rehab facilities in Florida. In addition the delegation received first responder training in dolphin stranding while in the Keys through the Marine Mammal Conservancy. Oiled Wildlife Response is another area of his formal training. Living in New York for almost 15 years has given him exposure to captive wildlife and whilst there he was also a member of The New York Wildlife Conservation Society. He has toured wildlife centres in New Mexico, Florida, New Jersey, New York and California, gaining lots of insight into their operation. In June 2013, the ECWC hosted the International Wildlife Rescue Council (IWRC) Basic Wildlife Rehabilitation 1 AB Course in Freeport, Trinidad. It was the first time it has been held in the Caribbean. There were 30 participants from all walks of life, including government officials from the Forestry Division/ Wildlife Section. The ECWC was awarded a Merit Award by the Environmental Management Authority in June 2014 on World Environment Day in recognition of its efforts towards responsible environmental management and sustainable development in Trinidad & Tobago. In June 2015 the ECWC once again hosted the IWRC's Basic Wildlife Rehabilitation 1 AB Course with 29 participants and an Advanced course in Pain and Wound Management with 17 participants. The Trinidad & Tobago Wildlife Rehabilitators' Association is now being formed to govern aspects of wildlife rehabilitation in Trinidad & Tobago. The plan is for the Association to host the Basic Course from 2016 onwards and for organisations to attain that certification as a requirement for membership into the Association, as a means of maintaining good standards of rehabilitation. 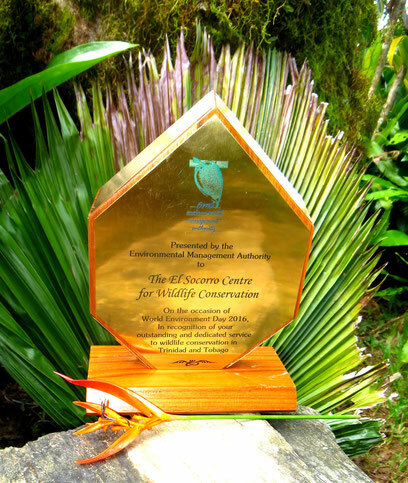 In June 2016, the ECWC was awarded a Green Leaf Award by the Environmental Management Authority in recognition of its continued dedication in the field of wildlife conservation in Trinidad and Tobago.